Bill Beaty's Tesla page. Tons of links and stuff. Bob Schumann's tesla page. Follow his progress on his coils. Bogdan R. Cosanovic's Tesla page. Brent Turner's high voltage page. Excellent layout. You wanna hire their show?? Cabbot Sanders dual secondary and ball lightning. Chip Atkinson's homepage. He runs the Tesla list. Go to his homepage to subscribe. Dave Archer Studios An artist who "paint" with his TC. Has done some art for Star Trek. Gary Weaver's science and technology page. Hall's homepage. ....and Tesla stuff of course. Hammer's Tesla Page A coiler from my neighbouring country Denmark. Kevin Nardelle's tesla page. Other HV stuff too. kVA Effects Some of the known coilers has formed this interesting company. Lightning On Demand Greg leyhs AMAZING projects. Largest classic TC project to date. Luke Mester's Tesla page.Nice photos and videos of their designs. Resonance Research Corporation Science museum exhibits. Scott's Tesla page. Home of the WinTesla program. Steve T. Cole's Tesla page. 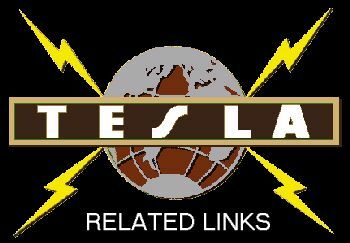 TCBOS (Tesla Coil Builders of Sweden) homepage. Tesla Systems research Daniel Greenhouse's company. Tesla Technology Australia A nice site from down under. Tesla Technology Research Yep, they build *BIG* coils and magnifiers. (Wysock's domain). The Tesla Museum in Belgrade. Original Tesla stuff!! Twenty First Century Books A nice mailorder bookstore. Tesla WEB Ring Loads of other Tesla Coil pages. FTP RESOURCE at ftp.funet.fi. Lots of info and pictures. Maintained by Kristian Ukkonen. FTP RESOURCE Some Tesla stuff. Neonsign info Everything you wanted to know about neon. John Wagner and his students gives us THE REAL STORY behind electrical revolution. Lightning Photography by Cori Prazen. Also links to other lightning pages.